Have you heard of IT’S-IT ice cream sandwich? Unless you’re from northern California, odds are you have no idea what I’m talking about and that’s sad. 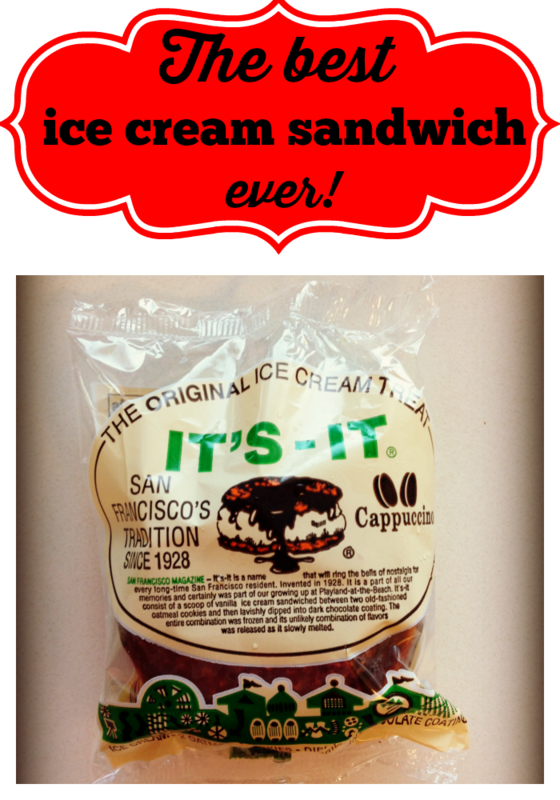 I’m talking about the IT’S-IT ice cream sandwich…well, it’s the best ice cream sandwich,ever. I’ve driven past the factory in the Bay Area and you can smell the oatmeal cookies baking. Oh the cookies! Add to that a big old scoop of ice cream. My favorite was chocolate, but that was elusive. Vanilla was the most common and so was mint for some reason. Cappuccino was the back up for the chocolate. Then, the whole thing is enrobed in chocolate…I’m salivating just thinking about how delicious it tastes. There was a trick to eating the sandwich. You had to keep it in the bag, or you’d end up with fingers full of chocolate. When I mentioned the IT’S-IT ice cream sandwich to my husband, he had no idea what I was talking about. That’s when I realized it’s a San Francisco Bay Area treat…not unlike Rice-a-Roni. Note: I’d link to their website, but Google thinks it’s hacked, so I’ll spare you (and me) that headache. This got me to thinking about regional foods. What foods are only available in or near your home state or area? Is there a food you long for, but are no longer able to find? Honestly, I’ve never seen their other products that the Wikipedia claims they make. This entry was posted in Food on May 9, 2014 by Amy Ruiz Fritz. I heard about these ice cream sandwiches from another blogger and wish I’d tried them when I was in SF last year! Regional foods like this are so cool- I can’t think of a brand or company off the top of my head, but people from outside NY generally won’t know what you mean if you walk into a restaurant and ask for an egg cream. The rest of the world calls it a French soda (choc or vanilla syrup, milk, seltzer), but I love egg creams 🙂 I’m also thinking of zeppoles (balls of fried dough, found at NY area pizza shops), potato candy in the Pennsylvania Dutch region, and whoopie pies in Maine. Yum! Ah yes! Zeppoles! I remember those from when I was a kid in New Jersey. I seem to recall them at a church bazaar or two. I have heard of egg creams, but never had one. I thought they were a Midwestern thing, but maybe they are East Coast.